In El Salvador, pupusas are served on every street corner, in cafes, markets, outside people’s homes, and by the beach. No matter what meal you’re looking to fill your belly for, the pupuseria will be there somewhere, with locals and tourists alike pouring through the door. In my two months living in Santa Tecla, I got more than a little addicted to these circles filled with flavour. I went a little pupusa loca. It turns out I’m not alone. 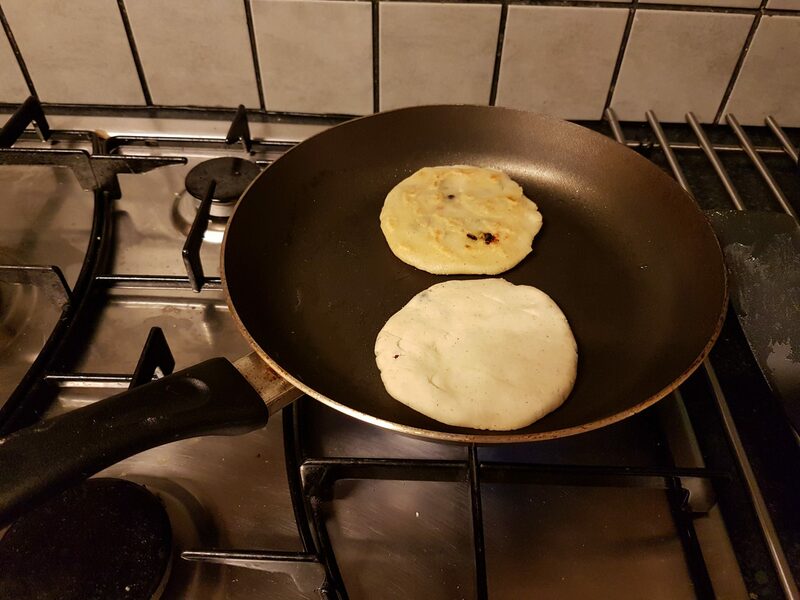 While taking part in a popular twitter chat recently, I found a fellow pupusa lover, and we set ourselves the food challenge of making our own. Here’s what happened! Eating is a big part of travelling for me. New adventures in flavour, smells and cooking ideas are just part of the fun of exploring. From sizzling chilli peppers tickling my nose in a kitchen in Hoi An, to the first time my teeth sunk into a fresh tamale, or to the new textures in tofu and zingy hits of my first nibble of fried jackfruit. These are the memories that will stay forever. Travelling as a vegetarian can be challenging in some parts of the world. Trying to find food that’s tasty and nutritious is not always possible. Latin America’s cuisine is particularly meaty, but I did find several veggie treats to eat throughout Central and South America. My favourite has always been El Salvador’s pupusas. 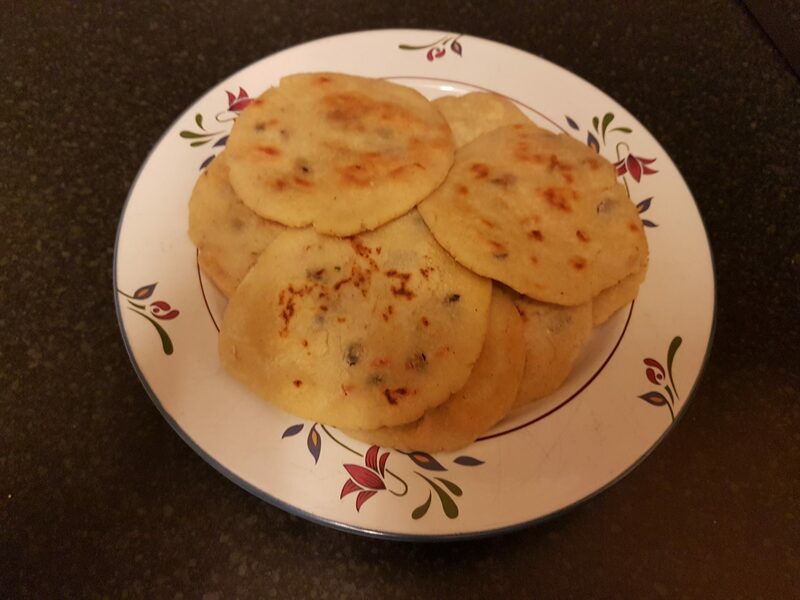 Pupusas are a traditional El Salvadoran dish, usually made with corn flour, but can be found in a rice flour variety, and even with plantain or potatoes. They’re eaten all over, but often served in specialist cafes called pupuserias. Pupusas can be stuffed with a variety of fillings, including pork, prawn, cheese and beans. There’s evidence that suggests they may have been around for up to 2000 years, although they became popular around the country in the late 20th century. These tasty circles are now considered to be the national dish of El Salvador. A pupusa loca heating up in Santa Tecla, El Salvador. Pupusa loca contained all the ingredients from the menu and was about 5 times the size of a normal pupusa! Pupusas were a real treat for me because you can pick your filling, so I could always get a veggie mix! On returning to the UK, I searched high and low for a pupuseria. Surely somewhere in London there would be an El Salvadoran cook – the city has food from all over the world. But alas, despite finding a number of Latin American tasty treats, and a popular pupuseria in London, Canada (! ), there was no pupusas to be found. So, I haven’t been able to taste one since leaving El Salvador in June 2014. This really needed to change! One drizzly day in Chester, I set out to make pupusas. I was nervous to recreate my favourite food again – would I even like it now? and could I possibly make it as good as those pupuserias? I wandered up and down the foreign food stores in town, searching what seemed like hundreds of different types of flour. 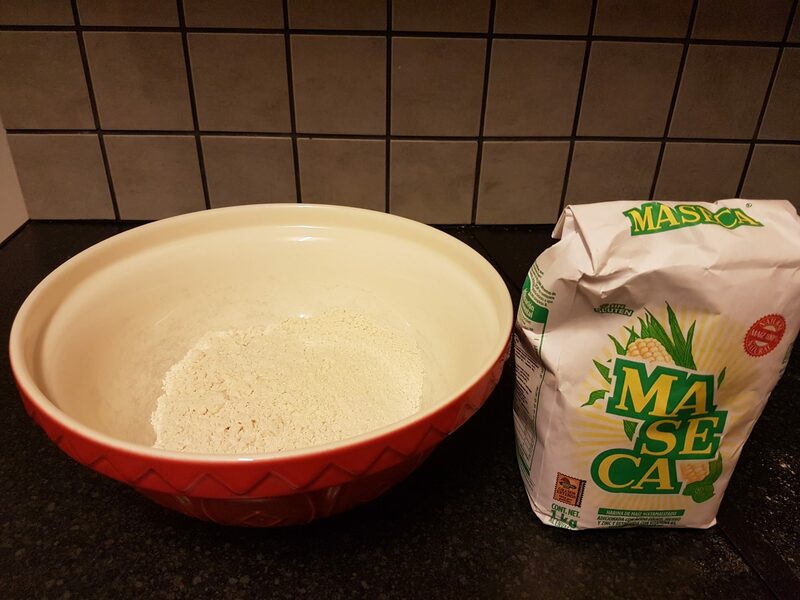 Pupusas, tortillas, tamales and many other classic Latin American treats specifically use a type flour called masa de harina. In the UK, this must not be confused with corn flour or cornflour – these are all different things (who knew!). Masa de harina is a type of corn flour that has been cooked in water with lime, before drying out. This gives it that distinct, slightly zingy flavour you may be familiar with if you’ve eaten authentic tortillas. It turns out it isn’t as easy as I thought to make pupusas in the UK. Chapati flour is popular, masa de harina is not. Hair dripping, and stomach rumbling, I admitted defeat and returned home empty handed to make cheese on toast. We wouldn’t be eating pupusas that day. After being thoroughly filled with British food, I resorted to a popular online search engine. Happily, I found masa de harina being sold in the UK in large portions to chefs. It’s not an easy thing to find at all here. I’m obsessed enough to order a bag from a restaurant provider. I pay for the most expensive kg of flour I’ve ever bought, and wait excitedly by the door for my package to arrive. Lets just call it the ‘golden flour’ from now on. A few days later, I’ve finally got all my ingredients ready and I start to make the dough. As soon as the water hits the flour, a familiar aroma of Central America hit my nose. That sticky, savoury corn scent that accompanies every meal. 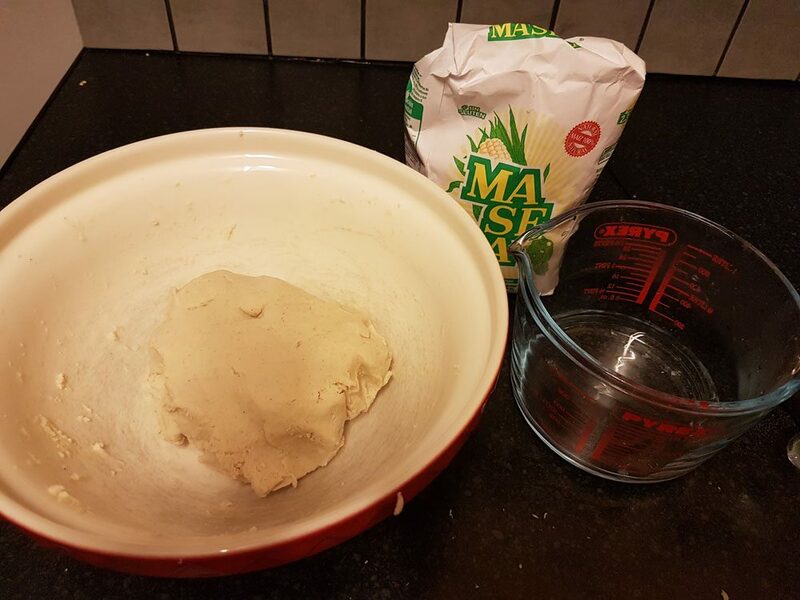 Masa de harina dough smells like my travel home, and I’m instantly whisked back to the dinner table of a family homestay in Guatemala, or a tamale snack from the street food vendor. Most importantly, I feel like I’m back in that welcoming pupuseria waft that drew me in so many times. I’m using this pupusa recipe sent to me by that fellow pupusa-lover on twitter, but I gave it my own twist. This will make 10 pupusas and you could fill them with whatever you want. My favourite during my travels: Pupusa de maiz con queso y jalapeno. 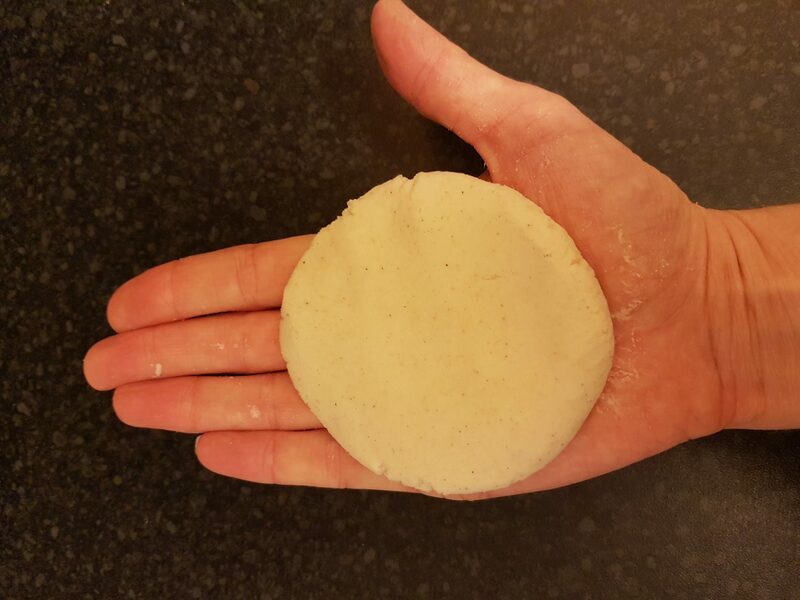 Add the water to the masa de harina and mix with your hands. I found it needed slightly more water than the recipe suggested. If this is the case for your dough, just add a little water at a time until the dough is sticky enough to roll into balls, but not so sticky it stays all over your hands. 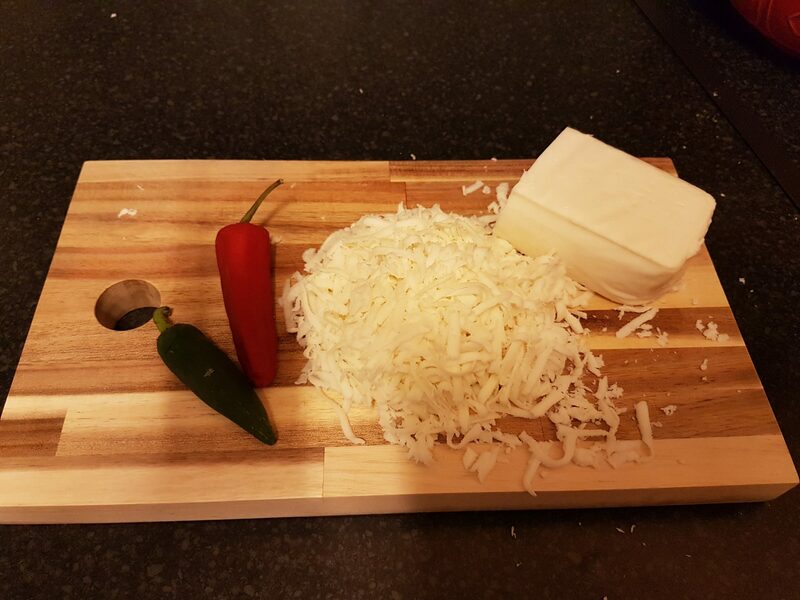 Chop the chillis and grate the mozzarella. 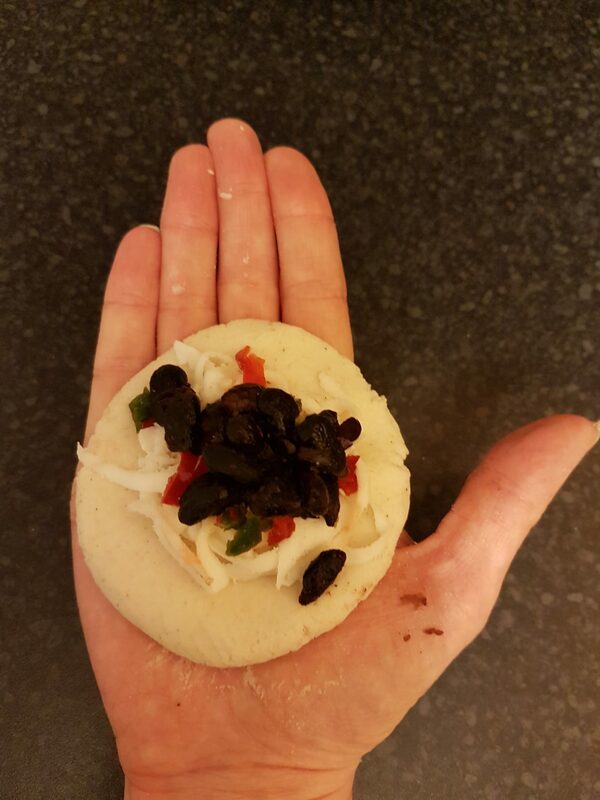 Flatten the dough in your hand so it is roughly the size of your palm. Place a generous pinch of mozzarella and chilli in the centre of the circle. Then add about a teaspoon of black beans. This is the tricky bit! You now need to pull the sides of the dough up and around the filling until it is completely covered. It may look like it isn’t going to stretch, but with a bit of patience and delicate pulling it will get there. Now roll it back into a ball. Flatten the ball in your hands so it becomes a round disc-like patty. 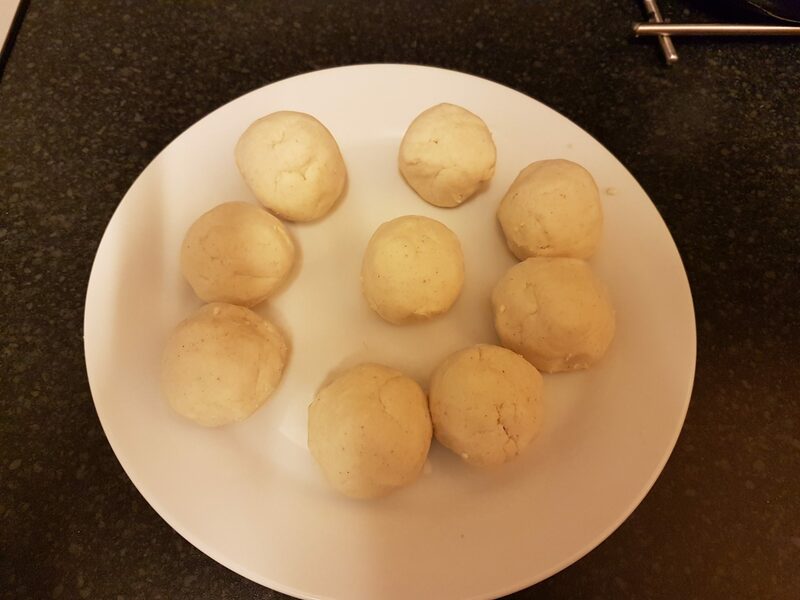 Gently pat the disc and pull the edges of the dough to make it slightly bigger. It should be a little less than half an inch thick in the end. Gently is the key word here, so you don’t lose the filling. It’s finally time to cook the pupusa! Fry it in a hot frying pan, lined with a little corn oil until it goes brown – about 3 minutes on each side. Ideally, serve with curtido – a kind of spicy coleslaw – and maybe a bit of chilli sauce. Eat pupusas until you can’t eat pupusas any more! What more can I say! Buen Provecho! The taste of El Salvador was in every bite, creating a real sense of nostalgia for my trip. You could do so many different things with the fillings – that’s one of the great things about pupusas. Making these took a lot of effort, but it was worth it to relive the fantastic memories. Have you ever tried to make a favourite food from your travels at home? How did it go? This post is part of the Wanderful Wednesday Link-up! 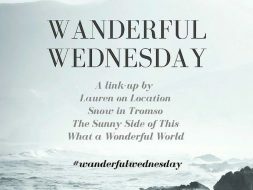 A blog hop for wanderers from Lauren of Lauren on Location, Van of Snow in Tromso, Isabel of The Sunny Side of This and me, Marcella of What a Wonderful World. Oh this is AWESOME Ali! My best friend in college was from El Salvador and she introduced pupusas to me. Luckily since we lived in LA, there were a couple of authentic pupuserias, and we always went whenever we had the cravings. It was love at first bite for me too. I loved the cheese pupusas and that sauerkraft topping… SO good! Sadly, I haven’t had it again ever since my college days! That’s so cool that you found a way to make it in back home… I”m drooling thinking about the taste of a pupusa now! Oh that sounds amazing – pupusas would be such a great college-survival food! ???? They are so addictive!! He he – yay! They are a little fiddly at first but after a few they get easier. I recommend playing around with the fillings too. Enjoy! ???? I love coming back home and trying to make the food I’ve tasted on my travels! It’s exactly as you described when you smelt the flour, it takes you right back. Scents seem to conjour up stronger memories that photos! So true. 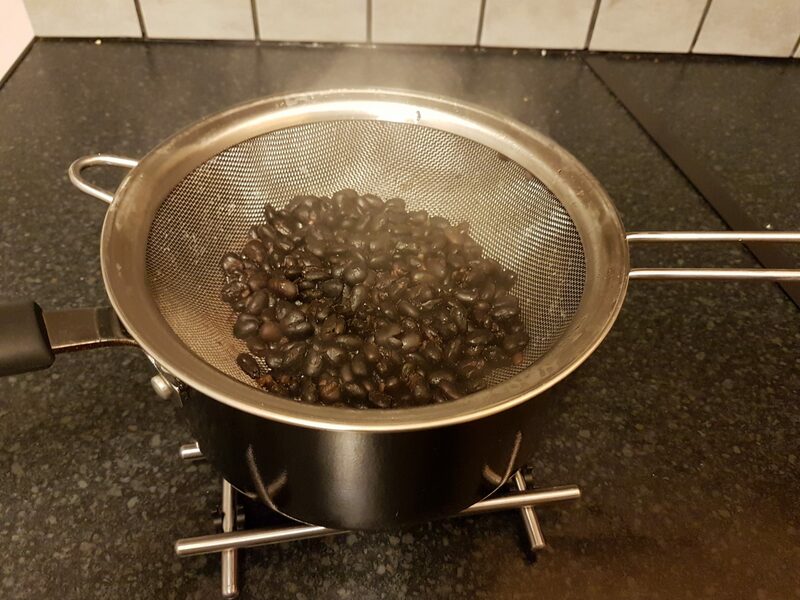 Smells and aromas can be so powerful! If only we could capture some scents while travelling to take home. Amazing! They would be my favourite colleague forever after that 😉 I’m so glad you liked them too! Definitely! Let me know if you like them if you do try 🙂 I’m going to attempt an Arepa next! Looks delicious., and doesn’t look too hard to make them. WIll give it a try! I used to live in Guatemala and feel in love for the pupusas from local Salvadorian restaurants! I decided to bring it to London and founded Quinta, the First Pupusas Makers in the UK !! We are based in Putney, trading on Saturday @Putney Market and Thursday @Imperial Wharf. We also do home delivery of ready-to-cook pupusas in Southwest London. And for my daily tortillas!! 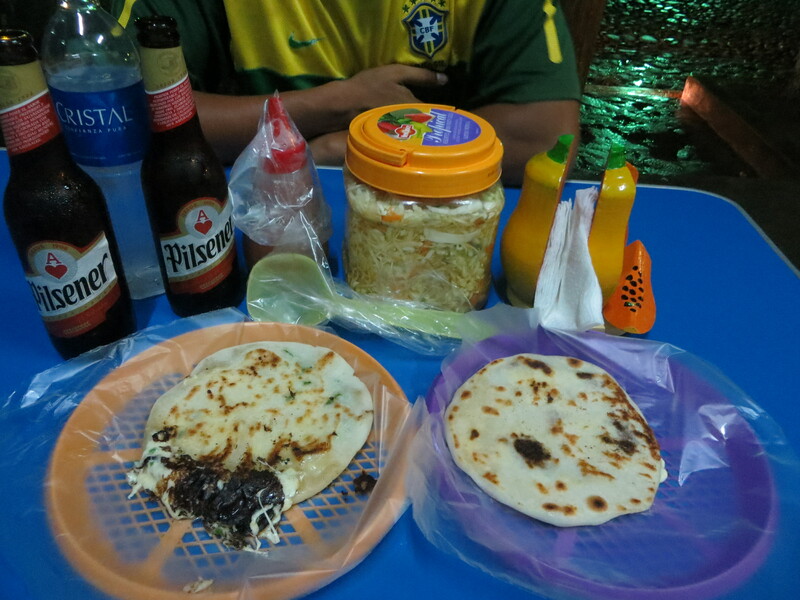 I met a young man from Salvador who raved about púrpusas and I’m determined to have a go. He mentioned using pork as a filling though. What else would normally go with meat in a purpusa?